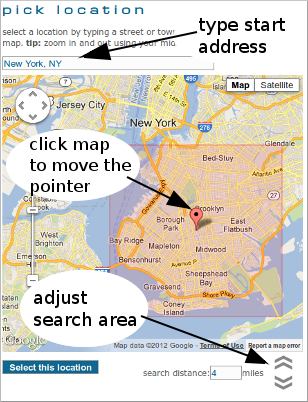 the following page explains how to use the location search feature on the quick search and power search pages. the location search feature needs to know a search starting point, and a maximum distance from that point that you'd like to see guys from, both of these are entered on the search page. how do i search for nearby guys? under "dude location" on the search page, click the HOME link (or GPS) link if logging in mobile) to have your current location loaded into the search form. the system will choose a default maximum search distance from that point of 30Km/19miles, if this is too far (or not far enough) then change the value in the "max. distance" box just below the location field, and then click "Search!". if you live near your countries border and only want guys from your country, tick the "from this country only" box. if you haven't set a profile location you'll need to choose a location first as described in the following examples. note: the 'nearby' link on the main linkbar gives rapid access to all nearby guys without having to use the search form. how do i reset the search location to search for guys around the world? click the RESET link under "dude location". 7/ click "Select this location" when done to have the search location and search distance values you've chosen loaded into the search form. note: for privacy reasons, the edges of the search area as displayed on the map are only approximate, your search may include or exclude members who are close to the displayed search area edge regardless of which side of the edge their true location is. if your profile location is set to brooklyn, you can skip stages 1-7 just by clicking the HOME or GPS link and entering an appropriate max. distance on the search form. 5/ click "choose this location"
if you already have your profile or GPS location set to somewhere in france, you can skip stages 1-5 just by clicking the HOME or GPS link. how do i search for all guys in a certain state? repeat the city example above, instead entering the name of the state you want to search, and adjust the pointer location and search distance in order to enclose the state you wish to search with the red search area rectangle. * use search distance in combination with "from this country only" if you want to search for members in a city very close to a national border and don't want to see guys from the other side of the border. * with a locaton set, you must select a search distance or tick the "from this country only" box, otherwise the search will return members from around the world. how does profile distance searching work and what are the privacy issues? how do i set my location or limit search results to a location? make a support payment / get extras for your profile! my profile text was removed - why was this? how do i post to the forums? the system tells me emails are 'bouncing' - what does this mean? how do i protect my pictures from being used by other people? how do i see who has been looking at my profile? how do i set my private pictures password? how do i upload pictures to my profile? how do i upgrade my browser to a supported version? how do i clear browser history? how do i stop the site sending me emails? how do i delete the messages in my deleted or sent messages folder? how do i edit or delete my forum posting? my profile says it is disabled! how do i fix this?